Took a fun test the other day and decided to share. Love doesn’t have to be as complicated as we make it. Make God the foundation, learn your languages, and make it happen! It’s Tuesday with Bianca! Let’s talk about LOVE! 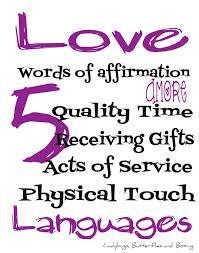 Recently I was asked about my love languages and had no idea what they were. So I took the test and discovered that I interpret love through Acts of Service and Quality Time. No surprises there! I’m all about showing verses telling. People can say anything but what they do is what matters most. I’m also a big believer that how someone chooses to spend their time is a good indication of what they value. You can’t love me and have to pencil me into your schedule. Loving me means making me a priority. Not the only priority but definitely a priority. This entry was posted in Tuesdays with Bianca and tagged bold and fab, family, God, Jesus, Love, love languages, marriage, relationships, tuesdays with bianca. Bookmark the permalink.